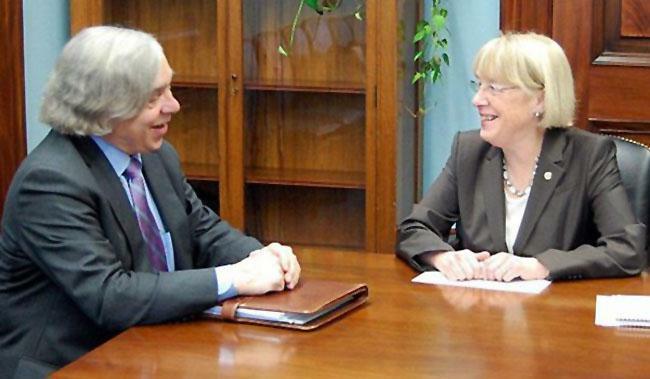 US Senator Patty Murray speaks with new Energy Secretary Ernest Moniz. Washington Senator Patty Murray says she’s looking for some change at the Hanford Nuclear Reservation with new leadership at the top. A new manager is taking over at a key contracting company that handles the leaking radioactive tank farms. 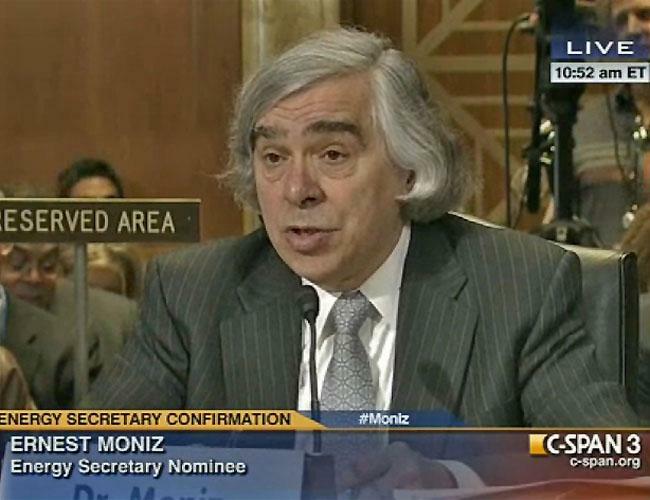 And the Department of Energy has a new secretary, Ernest Moniz. Murray toured the southeast Washington nuclear site Thursday to get briefings on the massive waste treatment plant being built and the ongoing cleanup of radioactive waste. “We have a new secretary of Energy right now and it’s very clear to me that he’s on the ground running and working to put that plan together, both in the short term and the long term,” she says. Murray is pushing to maintain federal funding for the nuclear site, despite controversies over its troubled waste treatment plant and leaking tanks of waste leftover from plutonium production during WWII and the Cold War. 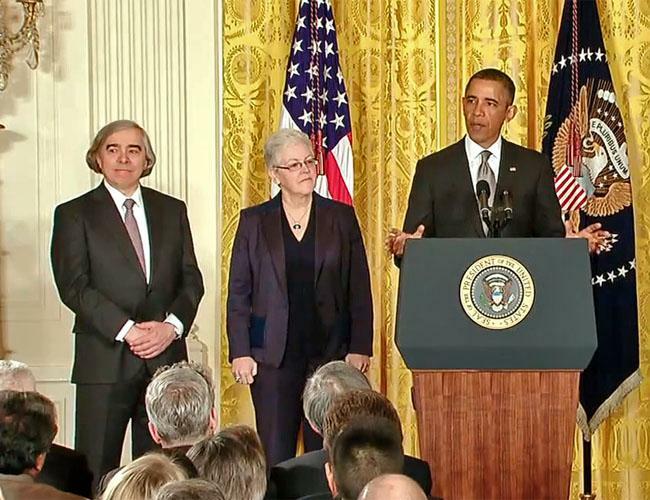 The Obama administration’s new secretary of energy says his top priorities are responding to climate change, safely managing the nation’s nuclear stockpile and fostering scientific research. 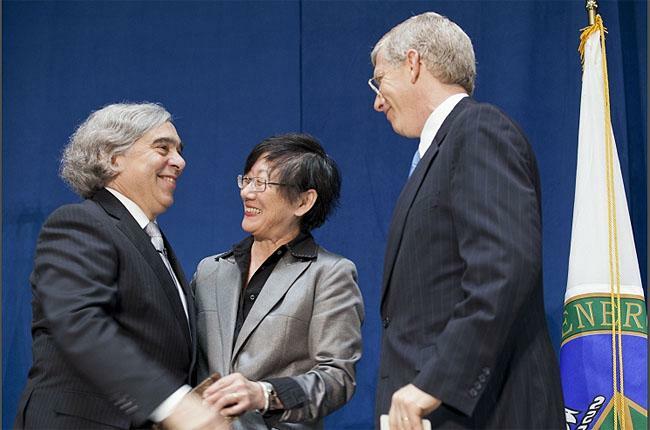 Ernest Moniz made the comments at his swearing-in ceremony Tuesday. President Obama’s nominee for U.S. Energy Secretary says he’ll visit the Hanford Nuclear Reservation soon if he’s confirmed. RICHLAND, Wash. – President Obama’s nominee for the next federal Energy Secretary is no stranger to the cleanup work at the Northwest’s Hanford Nuclear Reservation. Ernest Moniz was Energy undersecretary during the Clinton Administration and back in the late '90s he faced scrutiny about tank leaks at Hanford. The problem -- and question then -- was whether about a million gallons of leaked radioactive tank waste had reached the groundwater and was headed toward the Columbia River. Or if it was staying put in a dry layer of soil, above the groundwater.